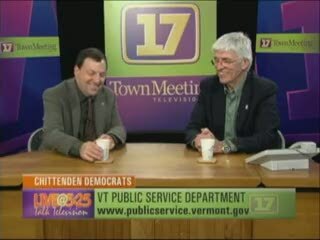 State Representative Mike Yantachka (D-Charlotte) interviewed Commissioner Chris Recchia on the Chittenden County Democrats Show. The show airs live at 5:25 PM on the first Monday of each month at the CCTV Channel 17 studio in Burlington. Commissioner Recchia and Rep. Yantachka discussed the different roles of the Department of Public Service and the Public Service Board. Video is compliments of CCTV , channel 17, Burlington, VT.